All operators worry about the same thing – the next outage that puts your vessel out of commission. Millions of dollars are invested every year into maintenance programs. 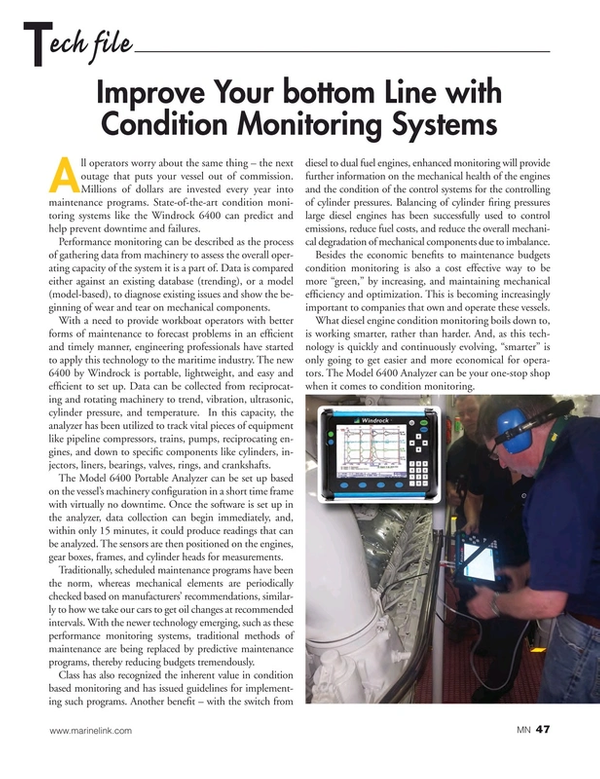 State-of-the-art condition monitoring systems like the Windrock 6400 can predict and help prevent downtime and failures. Performance monitoring can be described as the process of gathering data from machinery to assess the overall operating capacity of the system it is a part of. Data is compared either against an existing database (trending) or a model (model-based) to diagnose existing issues and show the beginning of wear and tear on mechanical components. With a need to provide workboat operators with better forms of maintenance to forecast problems in an efficient and timely manner, engineering professionals have started to apply this technology to the maritime industry. The new 6400 by Windrock is portable, lightweight and easy and efficient to set up. Data can be collected from reciprocating and rotating machinery to trend, vibration, ultrasonic, cylinder pressure and temperature. In this capacity, the analyzer has been utilized to track vital pieces of equipment like pipeline compressors, trains, pumps, reciprocating engines and down to specific components like cylinders, injectors, liners, bearings, valves, rings and crankshafts. The Model 6400 Portable Analyzer can be set up based on the vessel’s machinery configuration in a short time frame with virtually no downtime. Once the software is set up in the analyzer, data collection can begin immediately and, within only 15 minutes, it could produce readings that can be analyzed. The sensors are then positioned on the engines, gear boxes, frames and cylinder heads for measurements. Traditionally, scheduled maintenance programs have been the norm, whereas mechanical elements are periodically checked based on manufacturers’ recommendations, similarly to how we take our cars to get oil changes at recommended intervals. With the newer technology emerging, such as these performance monitoring systems, traditional methods of maintenance are being replaced by predictive maintenance programs, thereby reducing budgets tremendously. Class has also recognized the inherent value in condition based monitoring and has issued guidelines for implementing such programs. Another benefit – with the switch from diesel to dual fuel engines, enhanced monitoring will provide further information on the mechanical health of the engines and the condition of the control systems for the controlling of cylinder pressures. Balancing of cylinder firing pressures large diesel engines has been successfully used to control emissions, reduce fuel costs and reduce the overall mechanical degradation of mechanical components due to imbalance. Besides the economic benefits to maintenance budgets condition monitoring is also a cost effective way to be more “green,” by increasing and maintaining mechanical efficiency and optimization. This is becoming increasingly important to companies that own and operate these vessels. What diesel engine condition monitoring boils down to, is working smarter, rather than harder. And, as this technology is quickly and continuously evolving, “smarter” is only going to get easier and more economical for operators. The Model 6400 Analyzer can be your one-stop shop when it comes to condition monitoring.